The Hoban Run, a September tradition in Bay Ridge, keeps alive the memory of P.O. 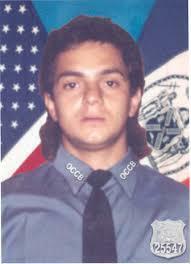 Christopher Hoban '80, who gave his life in the line of duty in 1988 at the age of 26. The Police Alumni of Xaverian established a memorial scholarship fund to honor their fellow officer. The Hoban Run is enthusiastically supported by the Xaverian Police Alumni, the NYPD, and the entire community. The Run not only keeps alive the memory of Chris' personal sacrifice, but it also serves as the primary funding of the Hoban Scholarship, which provides tuition assistance to sons and daughters of New York City Police Officers attending Xaverian. The 30th Annual Police Officer Christopher Hoban '80 5-Mile Memorial Run will be held on Sunday, September 16th, 2018, at Xaverian High School (7100 Shore Road, Brooklyn, NY 11209). The day begins with a Pre-Race Ceremony at 10am featuring the presentation of the P.O. Christopher Hoban Service to New York Award. The event, which is sponsored by the Xaverian Police Alumni, features a 5-Mile Run, 5K Run, Kids Dashes, and the Tina Hoban Hat Walk. There is a party following the run featuring awards, t-shirts, music, barbecue, raffles, and children's activities. The Hoban Run starts and finishes at Xaverian, located at 7100 Shore Road, in Bay Ridge Brooklyn. The 5-mile route follows the harbor promenade to the Verrazano Bridge and returns along Third Avenue. The 5k route starts at Xaverian and goes down and back along the harbor promenade and returns to Xaverian. Online: Please click here to register securely online. In Person: Saturday, September 15th, 3pm to 5pm or day of race, Sunday, September 16th, from 8:45am to 9:45am. Kids Dashes follow the 5-mile run. All participants receive a t-shirt and a medal at the finish line (while supplies last). The awards reception will follow the run in the schoolyard. The reception includes a barbecue provided by the staff of Circles, beverages, DJ, prizes, and children's activities. To sponsor the race, please download, fill out, and mail back this form. The Hoban Run In The News! Tablet Coverage of 2016 Hoban Run! Annual P.O. Christopher Hoban run makes its way through Bay Ridge! Online registration is closed, but you can still register to join the fun! Registration is open from 3 PM - 5 PM in the cafeteria tomorrow (9/15). Alternatively, you can also register on race day (9/16) from 8:45 AM - 9:45 AMin the cafeteria. Not up for a 5-Mile Run? Come down for the fun! Join us for the Backyard Party or the Tina Hoban Hat Walk!